THE EPO is wasting over a million Euros per year on spurious PR like pro-UPC events in another continent. There is also a lot of hogwash now that the EPO expels the independent judges or the boards they’re part of. Shortly after Battistelli was demolishing the boards and putting lipstick on the pig (see our translation of the hogwash) James Nurton is again, having done a softball ‘interview’ with Battistelli earlier this year in order to help him cover up/whitewash amid peak of a crisis (boiling point), jumping to his rescue. 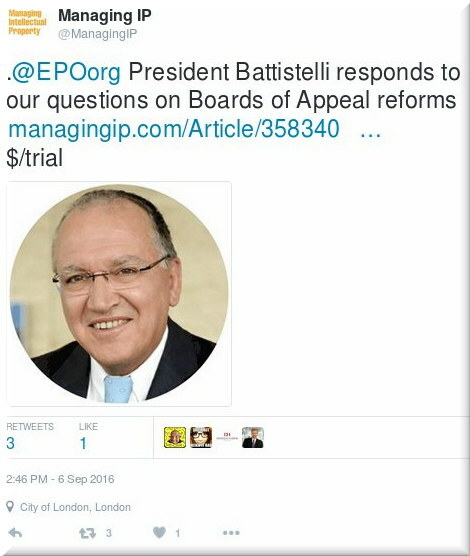 There is this new ‘Managing IP’ (MIP) nonsense titled “EPO President Battistelli on appeals reforms”. Why not just reprint a prepared (by the EPO’s PR team) ghostwritten piece? They frame this as an interview, but any fool can see what it really is. It’s supposedly behind a paywall (“$/trial,” as they put it in Twitter less than an hour ago), so the choir gets preferential access to the lies, the rest will find it harder to rebut (let alone see). This is a common tactic when suppressing criticism. The same goes for attendance at events where dissent is being discouraged/disallowed (e.g. by limiting who can speak and charging a furtune to attend, with exceptions/discounts to ‘desirable’ guests). So, basically, they are planning to publish complete and utter lies like those we explained under an hour ago (the so-called 'social conference' and social report/study). The problem is, MIP agreed to do the EPO management’s work. This shows that their integrity is flaky to say the least. They also profit from this event (over a thousand Euros for each person to attend a one-day event, assuming standard charges). “I know you claim to have a neutral position,” I replied to them, “but the speakers’ lineup will likely omit any opponents,” as usual. “They also profit from this event (over a thousand Euros for each person to attend a one-day event, assuming standard charges).”Well, perhaps foreseeing a backlash for licking Battistelli’s boot, MIP wrote to me this morning, hours before the puff piece and around the time the aforementioned event started. “We are very sad to see MIP becoming a lot more like IAM, which is the propaganda mill of Battistelli, still.”Well, being a guest at an event with thugs like Team Battistelli (and their bodyguards) doesn’t sound all that safe and besides, the place will be stuffed/stacked with pro-UPC people. It’s like entering the lion’s den. We are very sad to see MIP becoming a lot more like IAM, which is the propaganda mill of Battistelli, still. Well, they’re right. They get paid for,prviding a meeting space for discussions among IP professionals. The issue is extremely few want to discuss the advantages of “status quo”, which is incidentally also the current status “post-brexit-vote”. There is not more money for those advocating this position, but there may be more money in it for those who hope to profit from a change. So one side sees a chance to “invest”, the other sees no improvement in their position, so no need to invest, as any investment into defending “status quo” can never earn that money back. Also, too me it felt like they do not want to have a look at real politics. The current brexit situation does not allow politics to do much in this regard right now, but this seemed to be out of grasp for their minds. They want a change to happen, and find it difficult that politics sometimes cannot and will not listen to “expert”. Whoops, I am mixing topics again…. Yes, it wll be one-sided, but there will be a few who are of the opinion to stop UPC for the time being,and continue discussions once Britain has finally filed their article fifty notification or officially decided to stop the whole brexit discussion. But no discussion=no money for panel organisers. So IAM will continue holding panels. And advertise them. I just wishes they would try to attract a discussion starting from the other side. The discussion in situ may still go the old ways, but they would appear less biased.